Kick start your family's day with a nutritious breakfast. 2 How Many Calories Do You Need to Eat at Lunch Time? When you and your family get ready for school or work in the morning, you shower, brush your teeth, put on makeup or shave -- but you may not always eat breakfast. 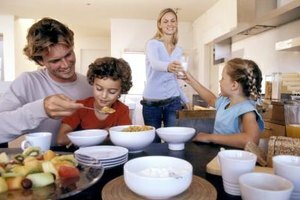 While skipping breakfast may save time during your family's morning routine, it can have consequences later in the day. These consequences may affect health, mood and even the body's ability to process food. Don't consider breakfast an option; instead, make it a mandatory part of your family's morning routine. When you go for a long period without eating, your body's metabolism slows down. So if you don't eat between dinner and the next day's lunch, your body begins breaking down calories at a slower rate. If you think skipping breakfast eliminates calories, think again. It actually kick starts your metabolism and starts your body burning calories for the day. Starting the day with breakfast also reduces your risk of extreme hunger by lunch, preventing you from gorging yourself. Studies show that people who eat breakfast consume fewer calories in a day. Eating breakfast is as good for the mind as it is for the body. If you skip this meal, you may struggle throughout the morning more than you would if you had eaten. Studies have shown that people who do not eat breakfast perform worse on memory tests and are not as alert. These effects wear off after people eat a balanced lunch. 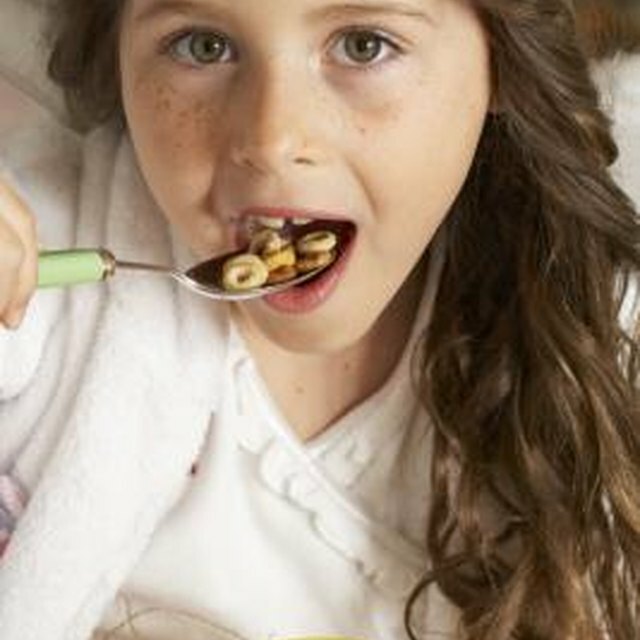 Help your kids perform well in their morning classes by serving them a healthy breakfast every day. People who do not eat breakfast may suffer fatigue and irritability throughout the morning. While some may compensate for tiredness by drinking coffee in the morning, this is not an adequate substitute. People who only drink coffee still do not perform as well on memory tests as those who eat breakfast. The physiological effects of skipping breakfast influence not only your memory, but also your mood -- grouchiness is a noted side effect of skipping the morning meal. Tired and grouchy kids won't perform their best, and if you're fatigued and irritable, your work performance will suffer. Breakfast isn't always a good thing, because you have to make smart choices. If you eat a sugary breakfast, like a doughnut, you experience a sugar rush that wears off before lunch, sending you on the search for another high-sugar snack. For a quick breakfast, turn to whole-grain toast with peanut butter or cheese. Serve with a glass of milk or orange juice. Or blend some low-fat yogurt and berries for a delicious smoothie you can drink in the car.